As you can see, some of these matches will be fascinating! So, starting Monday, June 25th with the release of episode #79, we will be bringing you new games every day through July 14th, the day before the end of the real World Cup. You can vote on each matchup and the winner is determined by percentage of votes. If the voting is within +/-5% of each other, it is declared a draw and each planet receives 1 point. 3 points for a win and no points for a loss. 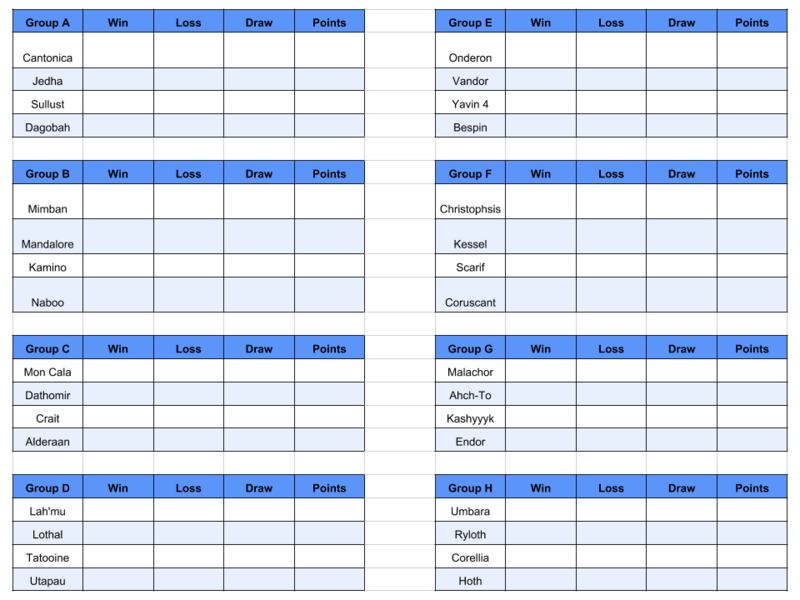 The top two planets from each group move on to the knockout stages and then each match is single elimination, with no draws and only wins or losses. Share it with friends on Twitter and Facebook and vote in our polls each day in either of those locations. Thanks for playing and the sole remaining winner will be crowned the 2018 Star Wars Worlds Cup champion and receive the coveted Worlds Champion Cup!